A lot of people travel abroad for business, pleasure or on an overseas student program. Whatever is the purpose of your visit, you have to be very careful about your personal finances and proper planning is very essential. Here are a few tips that might prove useful to you. necessity and not too much. Plastic money is safer than cash. So, keep international credit cards which are not only easy to carry but are also accepted everywhere. They are the most convenient method of payment. It also helps the traveler to defer payment and also gives him a favorable exchange rate. You should however check to see if all the details on the card are correct and take note of the date of expiry of the card. You can also do a survey and choose the company which offers the least fees and charges on the card, when used abroad. So, choose a ‘traveler friendly’ credit card. You should take note of your credit limit. You can also keep one credit card to a limit and another spare card in safe keeping for use if you lose the first one. It would also be best to get the phone numbers of the credit card company and the banks in the country/countries that you would be visiting so that you can contact them in case of an emergency. payment. 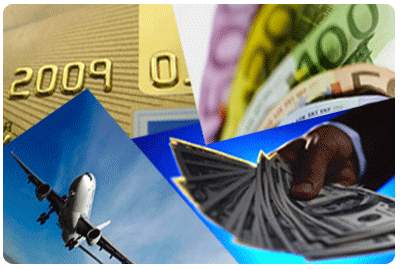 The debit cards are the cards given by the banks or financial institutions. So, this will be useful in drawing cash from your account at the ATM. You can also use it to pay for your purchases. The few disadvantages are that the card might get lost. It might not be compatible with the local ATM, You might forget the pin. You might suddenly realize that you do not have enough money in the account. Since it is technology dependent you may have these problems. Also, some special fees may be charged for international transactions. Sometimes the ATM’s may also run out of cash when you need it the most. You can also have a pre-paid debit card. This is not in any way connected to you bank account. You can buy it by paying a certain amount of money. So, it is a good option. The only difficulty will be when it is lost it will be difficult to replace it. This also has some fees you have to pay like – the purchase fee, international transaction fee, cancellation fee etc. The other method is taking traveler’s checks. They are very safe and are not expensive. The only disadvantage is that you have to get it converted to cash at exchange bureaus which might not be easily available. So, you have to find the exchange bureau to convert it to cash. Following are some precautions you need to take while traveling with regard to personal finance. You should always keep the money and all important papers and cards safe. The best method would be to have a money belt or some other bag which you can keep strapped on to you. Make sure to keep all the receipts of all your purchases, safely. This might be useful when you want to check the card statement when it comes for payment. Take care that there is no double billing. You might have booked your room at the hotel with a card but might decide to pay by cash. The hotel might already have billed it to your card. So, taking cash is the best option, but not always possible. Traveler’s checks can be used everywhere. Cards can be used only in some places. Both traveler’s checks and cards will mean that you will lose some amount in exchange rate. Traveler’s checks charge a higher rate compared to cash exchange rate. As you are charged by the cards after a certain lag time, you will not be able to negotiate on the conversion rate. of carrying cash – cash, traveler’s checks and credit and debit cards. This will mea that you have all the options open. If one does not work, you can use the other, according to need and convenience. So, follow these tips and enjoy your trip abroad.